New Belgium | Beer Apprentice - Craft Beer News, Reviews, Interviews and Info. Hi guys. How’s it going? For today’s craft beer review I’m going to be trying another collaboration brew. 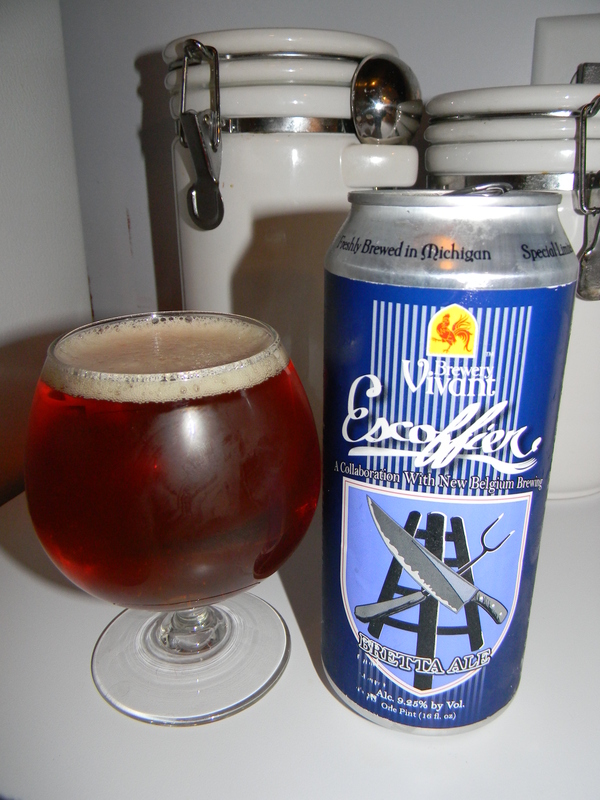 It’s called the Escoffier and it’s made by Brewery Vivant from Grand Rapids, Michigan and the New Belgium Brewing Company located in Fort Collins, Colorado. I’ve had a few beers from Brewery Vivant, however I’ve only had two beers from the rather popular New Belgium. For some reason they are not distributed in my area. I found the commercial description of the Escoffier from, breweryvivant.com, but you guys should check out newbelgium.com also to see some of what they have to offer. Escoffier is our much heralded collaboration with New Belgium Brewing in Ft. Collins, CO. Coinciding with their entry into Michigan, this project began with a friendly meeting at our pub. After a few beers and some food, the idea to brew a beer together started to take shape. Auguste Escoffier is considered the master chef of the 20th century. His ideas and methods left an indellible imprint on the culinary world, and are still in use to this very day. We named our beer ‘Escoffier’ to celebrate the relationship between great food and excellent beer, and how they elevate each other when enjoyed together. If you’ve ever visited our pub, this is the cornerstone of what we try to accomplish. Ok. Let’s have a drink. This brew came in a 16 oz. can and it had an ABV of 9.25%. It poured a clear, light cherry to amber color. The cap was off white, fizzy and soapy, and not particularly large. The retention time was slight. As was the lacing. The bouquet was very light. It did have a some meager hints of funk and yeast as well as some pleasant fruity tones of cranberry though. It was only a little bit tart smelling, yet it seemed to be balanced well. Overall, it was somewhat simplistic, but not too bad. The flavor was, again, a touch on the subdued side. Still it wasn’t bad though. Savors of fruity cranberry with a solid malty backbone. The yeast and funky “bugs” were toned down, however they did become a bit more prominent as it warmed and settled. It wasn’t so much tart or sour either. Just a little inkling to keep me interested. The mouthfeel was medium bodied. Mostly smooth with just a touch of sharpness on the back end. It was also a bit crisp and somewhat refreshing. That seemed crazy for a beer that had an ABV of 9.25%. The carbonation was a nice medium strength and only the most minor amount of warmth was felt long after the swallow. A decent shot of flavor was left on the palate after the consumption too. Overall, this was a pretty nice beer. It’s not really like the typical Sour/Wild Ales that I’ve tried in the past, but it’s solid enough and definitely worth a try if you can acquire a can. I know I wouldn’t mind having it again that’s for sure. I really appreciate Brewery Vivant and New Belgium for creating the Escoffier. I think it’s great that they are willing to share ideas so we can benefit from it. Maybe they will do more of these type of things and maybe I will be fortunate enough to fetch a few cans. With that being said, if you guys have ever tried the Escoffier let me know you thoughts. I’d love to hear another opinion. Thanks for reading and commenting everyone. I really appreciate it. Tonight’s review is of the New Belgium 1554 Enlightened Black Ale from the New Belgium Brewing Company situated in Fort Collins, Colorado. This brewery is fairly well known in craft beer circles, however I have only had the privilege to sample one other beer in my still infant days of reviewing. I have been informed that the 1554 is one of their best and that I should not pass it up. Many friends I have encountered have even gone so far to say it’s one of their favorites. The website, newbelgium.com, gives a worthy description. Born of a flood and centuries-old Belgian text, 1554 Enlightened Black Ale uses a lager yeast strain and dark chocolaty malts to redefine what dark beer can be. In 1997, a Fort Collins flood destroyed the original recipe our researcher, Phil Benstein, found in the library. So Phil and brewmaster, Peter Bouckaert traveled to Belgium to retrieve this unique style lost to the ages. Their first challenge was deciphering antiquated script and outdated units of measurement, but trial and error (and many months of in-house sampling) culminated in 1554, a highly quaffable dark beer with a moderate body and mouthfeel. I wonder if it will be one of my favorites as well? This beer came packaged in a 12 oz. bottle and had an ABV of 5.6%. The pour produced a very nice, delightful and gorgeous deep, dark ruby color that appeared very clear when held directly toward a light source. A light tan head was built with a medium aggressive pour that had wonderful, ample amplitude and excellent lacing. The lacing completely coated the inside of the glass and adhered for dear life for most of the drink. This thing looks really, really good!!! Well…. that’s a start!!! As I perused the aroma, I was greeted with a rather tame note of a roasted grain that had some sweetness. Dark fruits became evident, with a bouquet of plums and raisins, although they seemed to be a bit laid back and not very robust. A gentle whiff of chocolate teased my nose, but it seemed to also be a bit relaxed and not of huge stature. The taste revealed more of the chocolate, however it was, again, somewhat mild and with not a lot of volume. I did pick out some “whole milk” suggestions, which I found to be favorable and complimentary. The graininess that I encountered in the smell is also in the taste, but it is shoved to the side and almost hidden completely. The dark fruit is a little more encouraging. It really represents the taste more than the other characteristics. Very low bitterness compels the tongue to concentrate on the fruit and chocolate, which to me was a positive attribute. The mouthfeel was medium/thin. I found it to be smooth, mostly creamy and slick. I was a little disappointed to find that it did not leave much aftertaste on the palate, compounded by the fact that it became a bit watery as I continued through the drink. 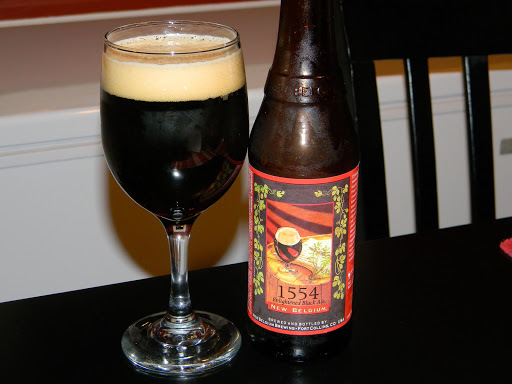 All in all, I found the 1554 to be very easy to drink, but a bit tame in both aroma and flavor. Everything seemed to be balanced well, however it was just a bit meek. As the description says, it was very “quaffable” and would be a great session beer. I was half way down the glass before I knew it. This beer is definitely not horrible or “wrong” by any means. In fact, I thought the appearance was wonderful. It’s worth a try for sure, but I, myself, would have liked to see it beefed up a bit. It’s not a beer I would ever turn down nor is it a brew I would ever scoff at, however I didn’t find that it was one of my favorites as so many others have. To me it was a good, manageable beer that was a few steps above average. I hope that doesn’t deter anyone from wanting to try it. Give it a shot and enjoy it. What did you think of the 1554? Have you had it? Did you like it? Let me know in the comments.